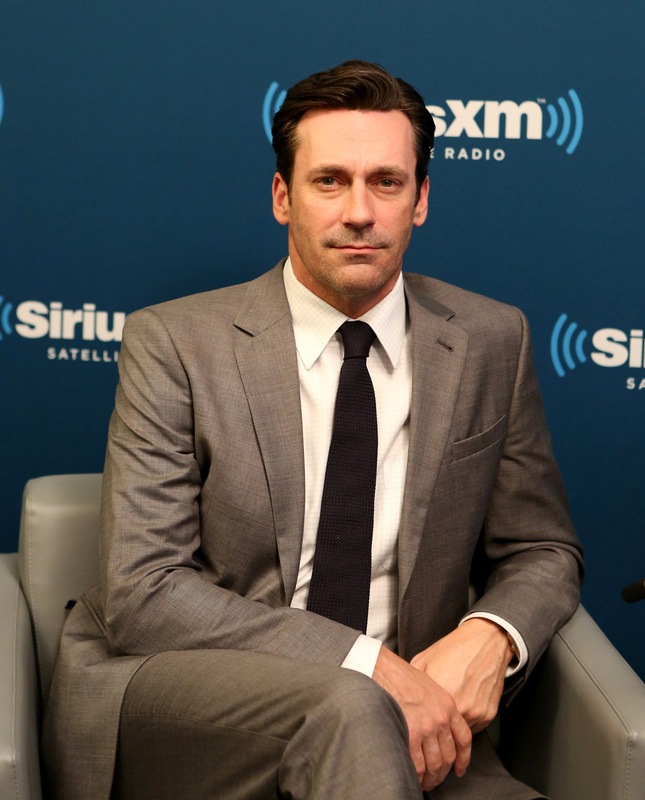 Jon Hamm may be one of the most lovable, charming, disarmingly good-looking individuals on the face of the Earth. However, there is one lady who has played hard to get with him over multiple years of courtship. Her name is Emmy, and she's not a real person, she's an award. How many Emmys has Jon Hamm won? None! The 66th Primetime Emmy Awards are coming up on Monday, Aug. 25, and Hamm is nominated for Outstanding Lead Actor in a Drama Series for Mad Men. For the range of feelings that he has brought to Don Draper over seven seasons of the show, you'd think his mantle would be lined with statues, right? But believe it or not, Jon Hamm has never won an Emmy. I know. It makes me sad too. The only thing that alleviates my sadness is this Jon Hamm selfie. However, things may be turning around for him this year. At least, if there's any fairness in the world, they should. With Mad Men in its penultimate season (penultimate-and-a-half season? ), it's about freakin' time that Hamm got a little bit of love from the Academy. Seriously, let's give Don some positive feedback before he dies! In this writer's opinion, no actor other than Hamm has made an anti-hero look so good. Plus, he does a mean baby impression. Sure, there are plenty of other deserving candidates in the same category at the upcoming Emmy Awards. Breaking Bad fans are free to disagree with me, as are Newsroom followers and True Detective-heads. Really though, this should be Jon Hamm's year at the Emmy Awards for plenty of reasons. Le sigh. When it comes to the Emmys, Hamm is seemingly always the bridesmaid and never the bride. From 2008-2013, he's been nominated every year in the category of Outstanding Lead Actor in a Drama Series as Don Draper in Mad Men. This year marks Hamm's seventh nomination. Although he's been overlooked in previous years, let's take a moment to recognize that this will be Hamm's second to last chance to take home a statue for this show. Let's give him his day, already, because we don't want to see him cry. Hamm has won numerous accolades for his work as Don Draper over the years. In 2008, the inaugural awards season of Mad Men, Hamm won a Golden Globe for Best Performance by an Actor in a Television Series. In 2009 and 2010 he won the Screen Actors Guild award for Outstanding Performance by a Male Actor in a Drama Series. In 2011, he brought home an award from the Television Critics Association for Individual Achievement in Drama and the Critics' Choice Television Award for Best Actor in a Drama Series. If he's good enough for all of these other esteemed institutions, he's good enough for the Emmys! Hamm is no stranger to stiff competition. This year, the Outstanding Lead Actor in a Drama Series category is stacked, just as it has been in the past. Bryan Cranston is nominated for his work as Walter White in the final season of Breaking Bad, after having won the award three times prior for this role. Both Woody Harrelson and Matthew McConaughey are nominated for their respective portrayals of Marty Hart and Rust Cohle in True Detective — sure, it's an amazing show, but with just one season, neither character has seen the development of Don Draper. Hamm is also joined in the category by Kevin Spacey, for his role in House of Cards, and Jeff Daniels in The Newsroom. Both House of Cards and The Newsroom are still relatively new shows, so these two will have more chances after this year. There are no more chances for Hamm. We've tuned in to watch Don Draper philander, drink bourbon, pitch ad campaigns, argue, and just live over the years. As we've seen over time, Hamm's ability to develop a character with so many layers is nothing less than virtuoso. He deserves the award this year more so than any previous one. Throughout all of Don's floundering and moral turpitude over the six seasons of Mad Men, he's grown into a fascinatingly complex character. Rather than an enigma, he's a damaged human being who is just trying his best, and desperately wants to connect to people and the world around him. Plus, this scene between him and Elisabeth Moss from "The Strategy," the episode for which he's nominated, made my heart explode. Again, it literally just combusted in my chest cavity. Don and Peggy, creative soul mates forever. Show of hands, would anyone support Draper, Olson & Partners with me? We just need an Emmy to cement it.